Last year, the Transcaucasian Trail Association was pleased to support Giorgi Jmukhadze in his participation in Earth Corps, an outdoor leadership program in Seattle that brings together US and international volunteers to learn about environmental issues, trail building, and land management while working on conservation corps crews in parks throughout the Puget Sound region of Washington. Giorgi is from Nikortsminda, Georgia, a small town in the mountainous region of Racha. 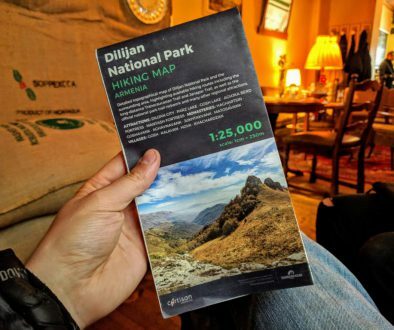 He volunteered with the TCT in Svaneti in the summer of 2017, where he displayed a great aptitude for trail work, leadership potential, and a passion to learn more about conservation. Knowing that the Earth Corps would offer an important opportunity for him to develop his interests, the TCTA supported Giorgi’s participation in the program, with the understanding that he would bring what he learned back to Georgia to help build the TCT and develop more conservation leaders in the Caucasus. 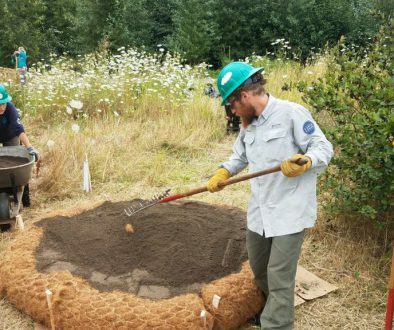 While in Seattle, Giorgi worked as part of a small team to help control invasive species, restore important habitats for native plant and animals, construct boardwalks in Hamlin Park, and produce a trail-development proposal for Saint Edward State Park. The team looking for Spartina Grass – an invasive species in the region. Earth Corps provides its participants with training in the technical aspects of conservation work, safety, and crew management. But technical skill development is only part of the Earth Corps experience. Giorgi talks of how his self-confidence grew in Seattle and his time as a corps member made clear to him that a future in environmental work was something that he could succeed in. Giorgi participated in workshops where he and his cohort took classes in different styles of outdoor leadership, and he had the opportunity to put what he had learned to the test as he led a crew of other Earth Corps volunteers on a week-long project in Mount Rainier National Park. The Earth Corps program arranges host families and provides a stipend and health insurance to international volunteers. The TCTA invested its resources to pay for Giorgi’s travel to the US and provide additional financial support during his six months with the program. The team loading onto an air-boat to get to the office. The TCT NGO of Georgia is excited to have Giorgi back in Tbilisi where he has assumed the role of Leadership Development Coordinator and crew leader for the TCT’s Youth Leadership Corps. The Youth Leadership Corps in an initiative the Georgian NGO started last year with support from the Austrian Development Agency. 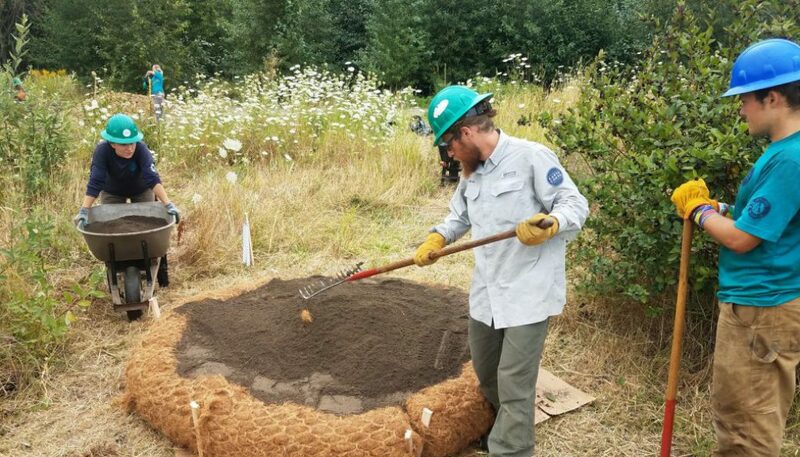 The program aims to introduce the conservation corps model to Georgia and emulate much of what Earth Corps has achieved in Seattle while building and improving important sections of the TCT and training future TCT crew leaders. 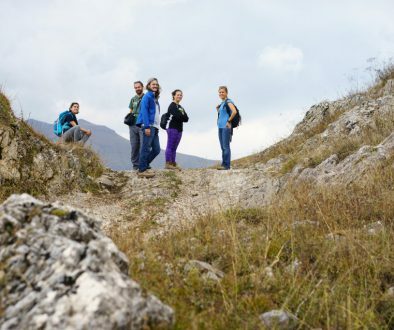 It provides training in first aid, sustainable trail design, and leadership for young Georgians (ages 18-25) over eight weeks in the summer. With Giorgi back on board, we are very excited for this summer’s projects, and the TCTA is excited to continue it partnership with Earth Corps by supporting more participants from the Caucasus region. Resting with the team at the top of a log pile. Maps For Hikers is 100% funded! Thank you all so much!